The Rodeph Shalom Congregation of Homestead, whose synagogue was recently destroyed by fire, has issued an appeal for assistance to enable it to erect a new house of worship. The former building was only partially covered by insurance and as the finances of the congregation are at a low ebb at present, the members have arranged to hold a benefit ball for the purpose of helping to raise funds. This newspaper article, which I found in 2007, was the first time I learned about this fire. It must have been a major catastrophe, but what had happened? The flat tone of the article concealed the real story. For seven years I wondered if I would ever know more. Four years ago, I thought the synagogue’s handwritten history would be my big break, but it only increased my curiosity by eliding over the event entirely. My curiosity was only heightened by the terse account. “Caught fire” — how? “Everybody was happy until [the fire].” Then what did they feel? When I was in Pittsburgh last week, I returned to the synagogue archive. The most detailed records that survive for the period of the fire are ledger books, but without the underlying chronology, they didn’t get me anywhere. I did recognize one sad detail: all throughout 1910 were large expenses for what appeared to be a renovation of a building whose destruction was at most a year away and would send them into debt. It is also a fact that several fire insurance policies have been cancelled recently as the fire insurance companies consider the risk too great to carry. A condition such as this has never been witnessed in Homestead before. I read through another week of newspapers before arriving at the 2/11/1911 issue of The Daily Messenger, whose front page story I had been expecting with growing dread. A fire which is believed to have been of incendiary origin, damaged the Hebrew synagogue on Ammon street to a considerable extent at 3 o’clock this morning. The loss is variously estimated, there being a wide difference between the amount placed by members of the congregation and Fire Chief C.K. Bryce. Members stated this morning that the fire was started on the outside of the building and was undoubtedly the work of some enemy of the Jews, while the chief is equally firm in his opinion that the fire caught on the inside of the building. 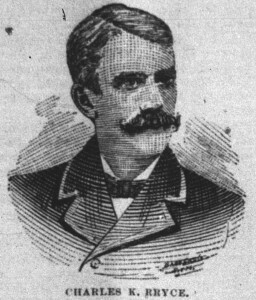 The belief of the members…appears to be corroborated by the fact that the fire caused a bright light, which illuminated Eighth avenue above McClure street. The church has recently been renovated and decorated at a cost of $1,000… Considerable of the carpet was destroyed and the entire interior badly damaged by smoke and water so that the interior will have to be practically done over again, which shows that the estimate of the members is much nearer the right figure than that of the fire chief. Chief Bryce stated after a full investigation that the fire was likely started from the outside…It was stated this morning that the authorities have accumulated considerable evidence and that an arrest may be made before many days. The following day the newspaper announced the results of the community meeting: a $500 reward for finding the arsonist. “No Citizen Is Safe. Jewish People Eager to Apprehend the Fire Bugs Who Have Been Operating Here,” read the subhed, and the article made the case that this reward was for the greater good of Homestead. The fire bugs…have given this town a black eye all over the county…It is hoped the party or parties responsible for these fires will be apprehended and punished for the acts which have resulted in a number of women and children narrowly escaping being burned to death. I read the paper through April 5, 1911, more than a month after this announcement, and in that time no arsonist was apprehended, though I don’t believe there were any further arsons, either. 2 Perhaps the heightened investigation the reward must have spurred frightened the fire-bug from his work. The “remarks and insinuations” did get additional coverage, much to my surprise, shedding light on just what this talk was about. “An Unjust Judgement” was the headline of an editorial published on the same day as the announcement of the $500 reward. Nor should all the race of Abraham be judged by the act of one or two men, any more than the act of one or two men of any other race should be the criterion of judgement of the rest. There are very many good honest men of the Hebrew race in Homestead and it is not right to put all the members of any race in one class. stimulate officers to make a strenuous attempt to land the miscreant. Seldom have the Jewish people been so earnest in vindicating themselves from an unjust aspersion as on this occasion, and it is to be hoped they will be able to unearth the mystery of this and other fires and bring to light this criminal of the worst type. These editorials caught the attention of Pittsburgh’s Jewish newspaper across the river, which expressed its appreciation for the support of the Homestead press in terms I cannot quote to you, because of course this one issue of the paper is missing. 3 But the Homestead paper was so pleased to receive this praise that it ran a front page story reporting on the Jewish Criterion‘s reporting on their reporting of the fire. And that’s the last word I’ve found on the subject so far. We have proof tonight of the respect and esteem in which the Hebrews of Homestead are held by our Gentile friends and neighbors, for looking about us we can see the most prominent citizens of our town honoring us with their presence at our table, willing to break bread with us and thereby showing that we have their well wishes. 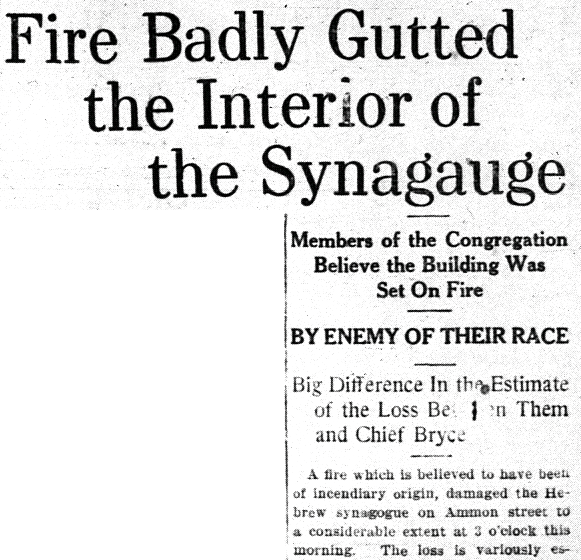 To quote The Daily Messenger, there are “rascals among every race,” but the continuing editorials suggest that while the arsonist may have been a lone rascal, the negative assumptions about the Jews’ culpability were prevailing. How depressing. I would have glossed over that, too, had I been the synagogue’s historian back then. In case you were wondering, the question of the cost of the damage and the ultimate insurance coverage remains unclear. The synagogue’s private financial ledgers record a $300 payment from the insurance company that arrived late May or early June as “Received from B Hepps fire ins. acc’t.” This is far from the $2,500 of insurance the paper quotes. I need to review the records again to see if there were earlier payments I missed, but it sure seems like the insurance payout was far less than what they expected. Meanwhile, expenses like “Hays Caloric (?) Repairing Synagogue” for $153, “Wiring + Hang chandliers [sic]” for $28, and “Elect Wire Repairing” for $28 quickly depleted that sum, and a $4,300 payment to “First Nat’l Bank (Lot)” for the land to build the new synagogue put them in the red by the end of the year. …Which brings us back to the January 1912 fundraiser announcement I started with. “Recently destroyed by fire,” “only partially covered by insurance,” “finances…at a low ebb” — it’s exciting after all this time to have found multiple sources corroborating the full meaning of these restrained phrases. Even after all this work I can never really know what it was like to have experienced these events, but it’s nice to know that at least some answers can be recovered. Update, June 2015: One of the questions many people have asked me about this fire was what happened to the Torahs, given what happened after the fire in 1996. I learned the answer last week when I met for the first time my cousin Paula Keizler Cramer, daughter and granddaughter of Homesteaders. She mentioned that the story was passed down to her that it was her grandfather, Morris Keizler, who ran into the burning synagogue to rescue the Torahs!